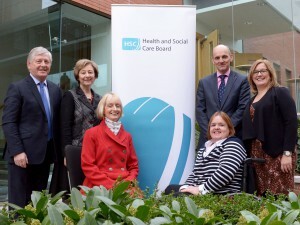 Pictured at the Health and Social Care Board’s Personal and Public Involvement event were (L-R): Dr Ian Clements, Chairman of the Health and Social Care Board ; Fionnuala McAndrew Director of Social Care and Children, Health and Social Care Board; Laura Collins, carer representative for the East Belfast Integrated Care Partnership; Jacqueline Magee, Personal and Public Involvement Officer, Health and Social Care Board; Dean Sullivan, Director of Commissioning, Health and Social Care Board; Sinead Malone, Regional Integrated Care Business Support Manager, Health and Social Care Board. A celebration event has been held for carers and service users to thank them for their contribution to the work of the Health and Social Care Board. Hosted by the Board, the purpose of the event was to mark the significant and invaluable work that service users and carers have contributed to date, to listen to their views and experiences working with the Board and to further develop the Board’s future plans for Personal and Public Involvement. Speaking at the event, Fionnuala McAndrew, Director of Social Care and Children with the HSCB said: “I am delighted that so many people took the time to join us today. Your involvement contributes greatly to the planning and reviewing of health and social care services in order to improve the health and wellbeing of the people of Northern Ireland. Over 60 service users and carers attended the event and were provided with an opportunity to speak directly to the Board Directors, Local Commissioning Group Chairs and Leads and other Board staff about their experiences. Attendees were able to inform Board members of what was working well and what needs to be improved on in the future. Dr Ian Clements, Chairman of the Board said: “Personal and Public Involvement is highly important to the Board. I am very pleased to have witnessed so many individuals that have contributed key roles to our work across all directorates. “This involvement enables us to ensure that the services we design and deliver are what the people of Northern Ireland need, and make a real difference to so many lives.